For the second time in the past few months, a Japanese angler has submitted an All-Tackle record claim for a large, unique species of grouper. The most recent submission, from angler Takayuki Shibayama of Osaka, Japan, is for the appropriately named potato grouper (Epinephelus tukula). Fishing with guide Takashi Nakazato on June 4, 2011 off Miyako Island, Japan, Shibayama battled this bottom-dwelling monster for seven and a half hours after it inhaled the live snapper he was using for bait. 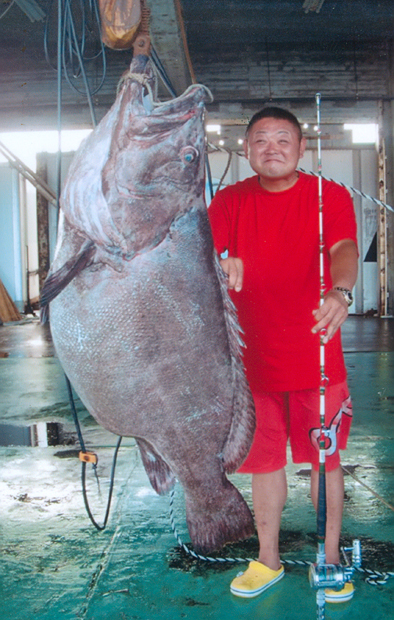 After the strenuous battle, Shibayama’s potential All-Tackle record fish tipped the scales at 77.85 kg (171 lb 0 oz). The current IGFA record is vacant.